For many of us, the food that we put into our bodies is very important. We want to be as healthy as possible to be able to live long, enjoyable lives without any complications. One way of monitoring health more closely is by making your own food. Knowing exactly what you are putting into your body is taking a step to becoming more healthy, and one way of doing this is by investing in a yogurt maker. A yogurt maker is exactly what it sounds like - a machine that makes yogurt for you. But, it makes yogurt that is a lot healthier than the yogurt you would buy in a store. Many of the top store brands that we love have delicious flavors and so many different types to choose from. But, most of these yogurts contain high amounts of preservatives, which don't sound as bad as they are upon hearing the word but are capable of doing long-term damage to your body. Preservatives are chemicals that are used in many different foods to preserve them as they are being sold so they won’t go bad. Even though they have good intentions, they are not good for human consumption for a long period of time and is why yogurt makers are a step closer to preventing their harmful effects. Making your own yogurt allows you to get all the nutrients that yogurt has to offer and more, and it lets you do so without any chemicals like preservatives lingering around in your food. 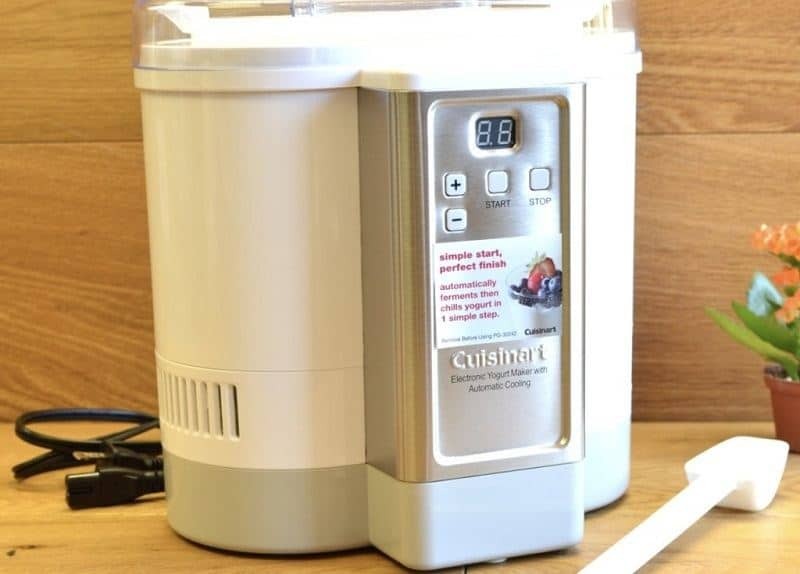 If you are interested in how to get a yogurt maker and the best one to choose from, keep reading to learn more about the Cuisinart CYM-100 electronic yogurt maker. When it comes to making any type of food, you will need to have time put aside to clean everything you need before and after making a meal, and is most times just as important as the cooking process itself. Having less time to clean up the things you need in the kitchen will give you more time to make the things you love. Making yogurt uses the same concept. You want to be able to get a yogurt that is easy to clean in between uses so you won’t have to waste a lot of time getting it clean enough for the next batch. Having removable containers within the product helps to be able to clean the part that contained the yogurt instead of the whole thing, saving time and energy. Another thing to always look out for when choosing what yogurt maker is perfect for you is what type of yogurt it produces. There are two main yogurt types that many of us enjoy, which are greek and regular yogurt. Greek yogurt has a few more health benefits than regular due to the different way that it is made and also has a different taste. To decide which is your preferred yogurt type, it is best to give Greek yogurt a try beforehand so you can know how it tastes. Many of us know how regular yogurt taste, but you'll never know which you truly prefer without trying both. The Cuisinart company makes products that make your life easier in the kitchen, making the cooking and consuming parts a lot more enjoyable. Their yogurt maker was created and designed to do most of the work for you so you won't have to go through the lengthy yogurt making process by hand. 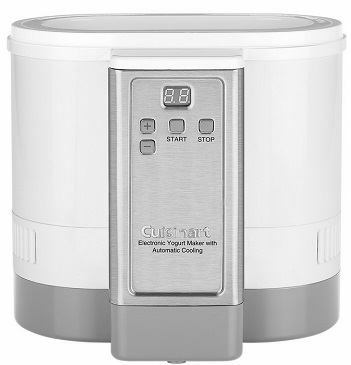 The Cuisinart electronic is the perfect yogurt maker for everyone. Due to its simplicity and design, no one will have any complications on how to use it and in getting an ideal batch of yogurt every time. All you do is make your yogurt mixture, add it into the container provided, set the timer and let the maker do all the work. It is equipped with a timer, which enables you to decide how long you want your yogurt to ferment. This also gives you options on how you want your yogurt to taste, since the longer you let it cook, the more tangy and thick it will be. It also has a cooling system that keeps the yogurt the right temperature after fermentation to ensure that it stays fresh. It is also has a capacity of 50 ounces which is a perfect amount for those of you that have multiple people that are yogurt lovers like you or if you eat yogurt very often. There is also a scoop that is included to enable you to split the yogurt into individual servings after it is completed to divide it amongst yourselves. Many of the customers that have this yogurt maker love how simple and easy it is to use, and they enjoy the results of the yogurt they are making. For most, it comes out creamy and delicious, and they didn't even have to do much to get it that way. If you have liked what you have read so far and is thinking about investing in this great kitchen appliance, you will be excited to hear that it is very affordable. 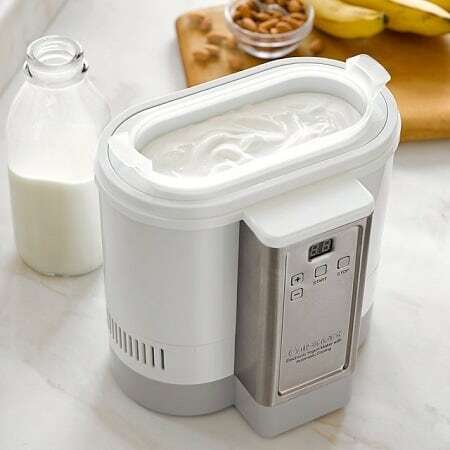 You can get this yogurt maker for just under $75, which is an amazing price considering how much quality was put into this yogurt maker. 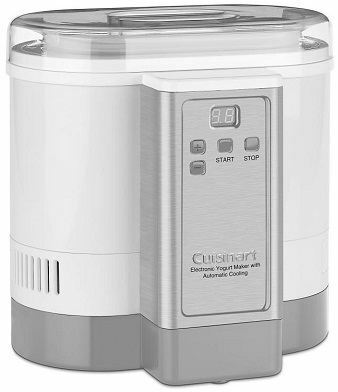 The Cuisinart CYM 100 electronic yogurt maker is an excellent choice for those of you that want to be more conscious about what they are putting in their bodies and don't want to go through the tedious process of making yogurt by hand. We hope that this review has given the information you need about this product to be able to make your decision.